This morning, with the market acting weakly once again, and with me sitting on approximately $50,000 of Meridian (VIVO)...I thought I might take a little off the table. So I sold 500 of my recent 2000 share position at $24.33. These shares were purchased yesterday at an average price of approximately $23.99, so they did have a small gain. As I write, VIVO is trading at $24.04, up $.04 on the day, so it appears, for the moment, to be finding support at the $24.00 level. I did promise last time NOT to be doing these "trades", but I am trying to learn how to identify these short-term trades successfully. My record is mixed at best. A Reader Writes "I am trying to figure out how the blogs are ranked..."
"I am trying to figure out how the blogs are ranked and who gets the most readers. How is yours? Also it sounds like your an amateur, do you work also? I trade some, but find it difficult to beat the overall markets, I think I over trade, ever heard that before......"
Thanks so much for writing Neil. I also am not sure how 'blogs are ranked'. I guess that is determined by the particular website doing the ranking. One of the more reliable blog ranking services is Technorati. "Technorati Authority is the number of blogs linking to a website in the last six months. The higher the number, the more Technorati Authority the blog has. Technorati Rank is calculated based on how far you are from the top. The blog with the hightest Technorati Authority is the #1 ranked blog. The smaller your Technorati Rank, the closer you are to the top." Well that at least is how Technorati does it. How many RSS subscriptions there are to the blog. How often people click on a link to the post in search results. How many blogrolls the blog is in. How many “high quality” blogrolls the blog is in. If the blog offers visitors the chance to tag posts, whether people are tagging them. References to the blog by sources other than blogs. If new posts appear in short bursts or at predictable intervals. If the content of the posts doesn’t match the content of feeds from the posts. If the content includes a lot of spam related keywords. If a lot of content is duplicated in multiple posts from a blog. Whether posts are the same size, or roughly the same size. Link distribution of the blog. If posts primarily link to one page or site." Then of course there are other lists of top blogs. For instance Wikio offers a list of the top 300 blogs. Here is a list of the Top 100 Personal Finance Blogs by FIRE Finance (a website I am not very familiar with). I even found a list of "Finance Blogs Readability Ranked" to help determine how "readable" some of the more popular blogs are. Finishing up with Technorati, this is a list of the top 100 blogs broken down by "number of fans". I suspect this is the sort of list you were looking for. You asked about how "popular" my blog is. At least on this main website, you can find out about my visits on my Sitemeter Page. Checking this evening, the 'counter' relates that I have had 209,921 total visitors and average 126 visitors/day. "Some of you point out that Alexa rankings are occasionally dubious. I agree the system is not perfect (I blogged about Alexa accuracy here), but it’s the least bad system we’ve got. BobsAdviceforStocks made number 1 on my list of Ten Great Finance Blogs Flying Under the Radar but is not included on the list below because the tripod.com domain does not give him an Alexa ranking. Unfair! I’ve included technorati whereever possible. Let me know if you have suggestions on how to make the list more comprehensive (or fair!). Look for an update Tuesday." They wrote me up in this Ten Great Finance Blogs Flying Under the Radar as their #1 choice. So that was a great comment from them. I hope I can live up their review. And the other part of your question---yes I do have a full-time job not involving investing. And I do spend far too many hours blogging about investing and stocks! And yes I am an amateur---if by amateur you mean a non-investment-professional! I am sorry to hear about you not keeping up with the market. Most mutual funds also underperform the market. "Though countless millions of dollars of shareholders' money is spent annually by mutual funds promoting themselves and the notion that they have "expert" stock pickers, the sad truth (or the funny truth, if you're in a laughing mood) is that the vast majority of mutual funds underperform the returns of the stock market (as represented by the S&P 500 index). Because of their excessive annual fees and poor execution, approximately 80% of mutual funds underperform the stock market's returns in a typical year. Over the past couple of years, that number has been going up, as mutual funds have been raising their fees to even higher levels. The average actively managed stock mutual fund returns approximately 2% less per year to its shareholders than the stock market returns in general. There is currently no reason to believe that this differential will improve, or that actively managed mutual funds as a group can ever outperform the stock market's average returns. For that reason, investors who are going to invest in mutual funds rather than in individual stocks should hold a very, very, very strong bias toward investing in index funds, which invest across the board in a stock market index." I hope that helps answer your questions and comments Neil! I greatly appreciate the time you took to write and I hope that my answers are helpful. We all work hard to do a bit better than the market. Generally, when I follow my disciplined approach (which I didn't do today! ), I have been pretty good at least keeping up with the S&P. Hello Friends! Thanks so much for stopping by and visiting my blog, Stock Picks Bob's Advice! As always, please remember that I am an amateur investor, so please remember to consult with your professional investment advisers. I wanted to report on my latest indiscretion. Meridian (VIVO) a holding of mine reported today. Latest sales for the third quarter increased 11%. EPS came in at $.19/share, down from $.22/share, but last year included a tax benefit of $2.4 million. Taking this out it worked out to $.19/share this year vs. $.16/share a year ago. Anyhow, the market has absolutely taken this stock apart. Daring to go into the jaws of this awful negative momentum, I purchased 2,000 shares of VIVO a few moments ago at an average cost of $23.99/share. As I write, VIVO has already slipped BELOW this price, currently trading at $23.81/share, down $(4.93) or (17.15)% on the day. I think this is way overdone. I am trying to think rationally in the face of apparent market madness. That can be a recipe for failure for me. But I shall put my contrarian hat on, hold my nose, and keep you posted. And probably wish me better discipline at following my own rules. I guess that is what defines me as an amateur after all. And I did it on margin :(. Yesterday I wrote about how I had sold a portion of my Graham (GHM) at a gain, and thus had a 'permission slip' to be adding a new holding to my portfolio. And I commented how that nickel was already 'burning a hole in my pocket'! That's what you get in Cracker Jack! But it isn't Cracker Jacks that I am talking about. I wanted it 'now' and it was a new stock! So this morning, with the market seeming to want to turn around and move higher I set out on my search for a new candidate for my portfolio. "...and its subsidiaries engage in the manufacture and sale of oil field pumping units, power transmission products, and highway trailers. 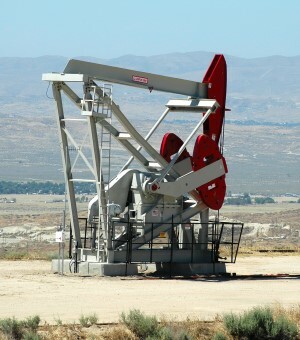 It operates through three segments: Oil Field, Power Transmission, and Trailer. The Oil Field segment manufactures and services artificial reciprocating rod lift equipment and related products. It also transports and repairs pumping units; and refurbishes used pumping units. In addition, this segment designs, manufactures, installs, and services computer control equipment and analytical services for pumping units, as well as operates an iron foundry to produce castings for new pumping units. The Power Transmission segment designs, manufactures, and services speed increasing and reducing gearboxes for industrial applications. It also manufactures capital spares for customers in conjunction with the production of new gearboxes, as well as produces parts for after-market service. In addition, this segment provides on and off-site repair and service for its own products, and also those manufactured by other companies. The Trailer segment manufactures and services various highway trailers for the freight-hauling market. It provides general-purpose dry-freight vans, flat-bed style trailers, and dumps, as well as replacement parts." Well, as the day went on it appeared that maybe buying an oil-related stock wasn't quite as brilliant as I thought it might be, with oil posting a very large drop in price today on top of yesterday's huge dip. "Today prices got another push downward because the Energy Department’s Energy Information Administration reported that U.S. commercial inventories of crude oil and petroleum products climbed by 7 million barrels last week. One reason: an increase in oil imports, perhaps partly as a result of slightly higher Saudi oil output last month (it takes 45 days for oil to get to the United States from Saudi Arabia). The EIA data also showed that U.S. gasoline demand was down 375,000 barrels a day from the same week a year earlier, continuing a trend of gradually declining U.S. fuel consumption. That comes a day after Mastercard reported that last week’s purchases of gasoline fell 5.2 percent last week compared to a year earlier. It was the twelfth consecutive weekly decline reported by Mastercard. That doesn’t mean high oil prices are over. U.S. commercial oil inventories are still down 55 million barrels from last year this time. “We’re at no place to be sitting back in a comfortable recline here,” said Ed Crandell, an oil analyst at Lehman Brothers. The economy could also pick up. Hurricanes could take out some production in the Gulf of Mexico. But if there is fizz in the price of oil (and it must seem like champagne to those producing it), the realities of supply and demand should ultimately correct that price, just as happened with the recent housing bubble and other bubbles in the past. Just don't ask me when." 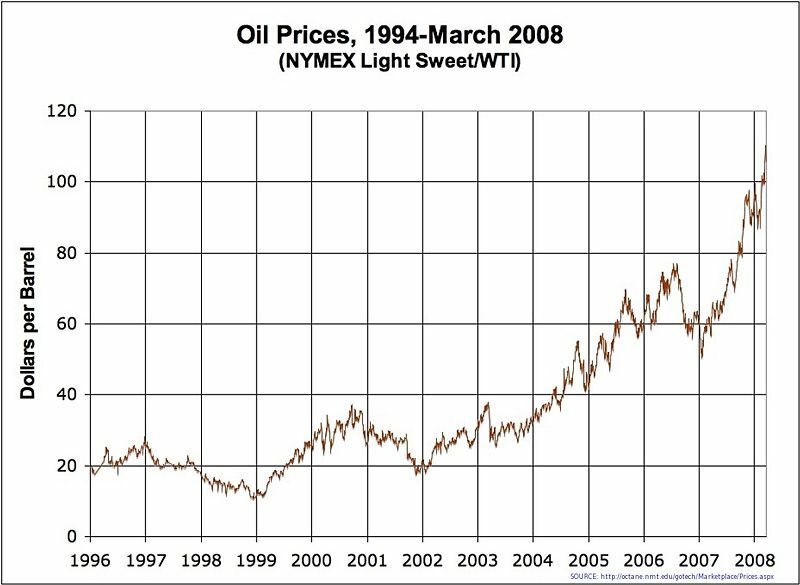 In any case, oil production is far more profitable at even $100/barrel then the $60/barrel price it was at the start of 2007. And this graph doesn't even show the last few months as oil prices soared towards $150/barrel! Anyhow, back to Lufkin (LUFK). How did Lufkin do in the latest quarter? It was the announcement today of 2nd quarter 2008 results by Lufkin (LUFK) that drove the stock higher! For the quarter ended June 30, 2008, sales increased 30.6% to $174.5 million from $133.6 million in the same quarter last year. Net earnings came in at $21.2 million, or $1.44/share, up from $17.1 million, or $1.17/share the prior year. The company beat expectations of $1.36/share according to analysts polled by Thomson Financial. To top it off, the company also raised guidance for the full 2008 year to earnings of $5.50 to $5.70, up from prior guidance of $5.10 to $5.30/share. This exceeds analysts' current expectations of $5.28/share according to thomson financial. It is this combination of strong financial results that exceed expectations and the company's raising of guidance that really got my attention! "The high demand from the North American market, coupled with a change in buying practices that resulted in larger quantity orders from U.S. customers…resulted in very strong new orders during the quarter,"
"The flood of new orders more than tripled the company's oil-field-unit backlog, which stood at $170.9 million, compared with $55.8 million a year ago"
Somehow, I am not a big believer that this correction in the oil price will result in any real significant and long-term decline in the price of oil. But I could well be wrong and terribly out of synch with this purchase. Time will tell. And how has this company done long-term? Reviewing the Morningstar.com "5-Yr Restated" reveals a picture of steady growth from 2003 to 2006, and then in 2007 the company appeared to stall a bit as revenue, which had increased from $262 million in 2003 to $605 million in 2006, dipped to $597 million in 2007 and to $596 million in the trailing twelve months (TTM). Similarly earnings have increased sharply from $.73/share in 2003 to $4.83/share in 2006 and $4.92/share in 2007, but then have dipped to $4.81/share in the TTM. But it was the recent quarterly result that suggested the company was 'back on track' financially and heading to steady growth that led me to overlook this 'blemish' on the record. The company has been paying dividends and increasing them from $.36/share in 2003 to $.88/share in 2007 and $.92/share in the TTM. Outstanding shares have been very stable with 13 million in 2003 increasing about 12% to 15 million in the TTM. During this same period, revenue was up over 100% and earnings increased more like 500%. Not much of a 'dilution' of results from my perspective. Free cash flow has increased from $8 million in 2005 to $71 million in 2007 and $54 million in the TTM. The balance sheet appears solid with $103 million in cash and $205 million in other current assets, easily covering the $72.5 million in current liabilities, working out to a current ratio of 4.25. The company has a relatively small amount of easily-covered long-term liabilities listed at $48 million. The balance sheet appears solid to me! Reviewing the Yahoo "Key Statistics" on Lufkin (LUFK), we can see that this is actually a small cap stock with a market capitalization of only $1.34 billion. The trailing p/e is a moderate 18.90, with a more reasonable forward p/e of 15.01 (fye 31-Dec-09) estimated. The PEG ratio works out to an acceptable (imho) level of 1.53 based on "5 yr expected" earnings. With the recent earnings report, estimates should be moved higher and the PEG should fall back well under 1.5. Looking at some other statistics, according to the Fidelity.com eresearch website, the company is reasonably valued in terms of the Price/Sales ratio relative to its peers. The Price/Sales (TTM) works out to a 2.05, much lower than the industry average reported by Fidelity at 3.62. Fidelity suggests that the company might not be as profitable as its peers as it came in with a Return on Equity (TTM) ratio of 19.06%, below the industry average of 27.91%. Finishing up with Yahoo, there are 14.78 million shares outstanding with 14.05 million of them that float. Currently, as of 6/25/08, Yahoo reports that there are 1.2 million shares out short representing 8.6% of the float or 6.9 trading days of volume. With the great earnings report, we may well have been observing a bit of a 'squeeze' with the short-sellers scrambling to cover their negative 'bets'. As I have noted above, the company pays a small dividend with a forward rate of $1/share yielding 1.2%. The last stock split was 4/20/05 when the company had a 2:1 stock split. 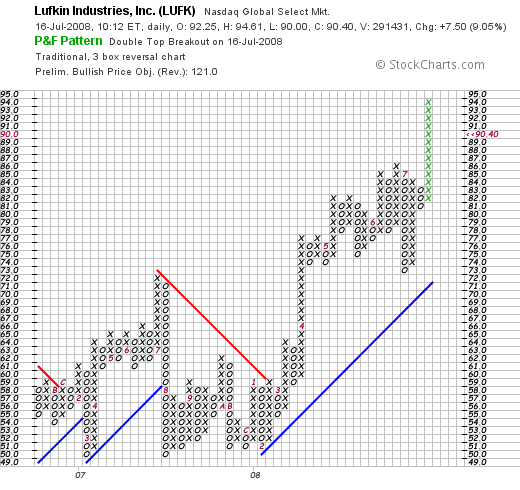 If we take a look at the 'point & figure' chart on Lufkin (LUFK), we can see that the company has been relatively flat betwen 2007 and early 2008 trading between $50 and $72. In March, 2008, the stock broke through resistance at the $58 level and has now moved strongly higher, peaking at $94 before closing at $90.40 today. I had the opportunity to buy a stock to add to my portfolio today. This was based not on my assessment that it was time to buy, but literally from a signal generated by own account. Lufkin (LUFK) made the list of top % gainers. It reported solid earnings today that beat expectations and they went ahead and raised guidance for the whole year. The results today put the longer-term financial picture back on a track of solid growth in revenue and earnings, stable outstanding shares, growth in dividends, and a solid balance sheet. Valuation appears reasonable. On the downside, simultaneously with this earnings announcement has been a short-term (?) sharp decline in the price of oil. A further large decline in oil prices would undermine some of the support for a company like Lufkin that is involved in the sale of oil production equipment. Otherwise, the picture is solid, and I like the stock. In fact, I purchased shares today! I don't know if I may have struck a 'gusher' or have slipped in an oil slick. Time will tell. I am now up to six positions and am feeling a bit more optimistic about investing today after the solid market performance and my own signal to be buying! If you have any comments or questions, please feel free to leave them on the blog or email me at bobsadviceforstocks@lycos.com. Be sure and visit my Covestor page where my actual trading account is monitored, my SocialPicks page where my past 'stock picks' are evaluated, and my Podcast Page where you can download some mp3's on some of the many stocks discussed on this blog. As part of my continued effort at sharing with all of you readers my actual trades in my actual trading account, I wanted to let you know that this morning, shortly after the opening, I sold 15 shares of my 105 share position of Graham (GHM) at $86.00/share. Grahm (GHM) continued to do well today in spite of the awful market tone and actually closed at $90.50, up $2.45 or 2.78% on the day. Why did I sell any shares? Why 15 shares? Why today? If you are a regular reader of my blog, you will know that I sell shares of stocks for two basic reasons: "good news" or "bad news". I define "good news" as a stock reaching appreciation targets...that is going higher in price...and reaching levels that I have set up artificially at certain percentage gain levels. To explain, I use 30, 60, 90, 120, 180, 240, 300, 360, and then 450, 540, 630%...etc., appreciation levels from the original purchase price as intermediate goals. That is when a holding reaches these levels, if it ever does, I initiate a sale of a portion of that holding. When I first started this blog I believed if a stock moved higher 1/3 to 4/3 of its original price (an approximately 30% appreciation), then it made sense to always be selling 1/4. But that was, as I found out, far too extreme a portion of a holding to sell at these same intervals as my position shrunk in size as the stock appreciated in price. I tried 1/6th....but again no luck. It appears that selling 1/7th of a holding is working at taking a portion 'off the table' yet leaving enough behind to see it actually grow absolutely. The "bad news" part of a sale is when a stock is sold either because of some fundamental news announcement (like a poor earnings announcement or the management accused of wrong-doing), or simply because the stock has declined from a higher level. Generally, after a stock has declined 8% I sell the stock if I have never sold any portion of it at an appreciation target. If, on the other hand, I sold 1/7th of a position (like I did today with Graham) and then the stock dips in price...I do not plan on waiting for an (8)% loss to sell, but instead move the sale price (of the ENTIRE position) to 'break-even'...that is, the price that I purchased the holding. On the other hand, if I have sold a stock more than once at different appreciation levels...for instance if I sold a stock three times at 30, 60, and 90% appreciation levels...selling 1/7th of my holding each time....then instead of waiting for an (8)% loss, or even waiting for the stock to move back to 'break-even', I sell the stock should it reach 50% of the highest appreciation sale level. In this case, since the highest appreciation sale of this hypothetical holding was at a 90% appreciation level, then my sale point on the downside is if the stock declines to a 45% appreciation level. All of my sales on the downside are ENTIRE positions---unlike my partial 1/7th position sales on the upside. Anyhow, I am sure that for you regular readers this commentary is entirely redundant. But if you are new to this blog, I hope you appreciate some of what I would call my "inner-workings" of my portfolio management strategy. Finally, I use sales of stocks as signals. Signals that in the case of sales on the upside or "good news" sales, suggest that the environment might be o.k. to add a new position. I call this my "permission slip" to add a new position (if I am below my maximum of 20 positions). Likewise, I use a sale of stock on "bad news" as a signal as well. In this case telling me that there is something 'bad' in the environment and that I am well-advised to do what I call "sitting on my hands" with the proceeds (again, of course, unless I am at my minimum of 5 positions--in which case I would replace the holding with a suitable candidate). It is this way that I can shift my holdings in a fairly automatic fashion between cash and equities. This part appears to be working as I am now at 5 positions and the market environment is frightful. My 105 shares of Graham (GHM) were purchased in my Trading Account at $64.48/share. With stock hitting $86, this represented a gain of $21.52 or 33.4% since purchase. This exceeded my 30% appreciation target yesterday, so this morning I sold 15 shares or 1/7th of my 105 shares, leaving me 90 shares which actually went ahead to move higher. Ironically, I have now been handed a 'permission slip' to be adding a new positions. I didn't find anything 'suitable' today on the top % gainers list (where I start looking), and thus decided to continue to 'sit on my hands' with the proceeds. That nickel is burning a hole in my pocket already and I shall be on the lookout tomorrow as well for something suitable for my portfolio. Thanks so much for stopping by! If you ahve any comments or questions, please feel free to leave them on the website or email me at bobsadviceforstocks@lycos.com. If you can, be sure and visit my Covestor Page where my Trading Portfolio is monitored, my SocialPicks Page where my many picks from the past year or so are reviewed, and my Podcast Page where you can listen to some of my past and recent podcast shows on stocks. I always like to update you with a sample of some of the news stories I have found on Prosper.com. First of all I came across an article from ScienceDaily suggesting that consumers might fare better with a website like Prosper.com than seeking traditional loans through banks and other financial institutions. "The study -- “The Democratization of Personal Consumer Loans?” -- analyzed a database of 5,370 peer-to-peer loan auctions from the Web site Prosper.com. Prosper.com, and other companies like it, allows people to lend and borrow money at more attractive interest rates than they find at a bank. The study also found that decisions made by lenders about whom to give loans to are much less likely to be influenced by race or gender." However, on a balancing note, I also found an interesting story about "Racism in Peer-To-Peer Lending"
"Looking at data from Prosper, Devin Pope of Wharton and Justin Sydnor of Case Western Reserve University found that a listing with a picture of a black person was 25 to 35 percent less likely to get funded than a listing with a white person with similar a profile. And when a black person did get funding, the interest rate charged was about 0.6 to 0.8 percent higher. (More likely to find funding were women and those with photos that showed a link to the military. The funding success for latinos and asians wasn't statistically different from the average. Another recent study of Prosper by Enrichetta Ravina of NYU found that attractive people are more successful in landing loans and lower rates than their homelier peers.)" Personally, virtually ALL of my loans are done on 'auto-pilot' with portfolio plans. I am relatively risk-averse and have chosen to bias my lending towards higher-rated borrowers in a more 'conservative' fashion. "With the increasing scarcity of bank loans because of the economy's credit crunch, entrepreneurs are thirsty for new sources of capital. One such alternative is peer-to-peer lending, in which people lend other people money directly, without the involvement of a financial institution. Transactions take place online, incorporating elements of social-networking sites. Websites such as Prosper.com and Kiva.com connect borrowers and lenders, and the prize on the table is investments. Peer-to-peer lending sites tap into the popularity of social networking on the Web, hoping to imitate the success of MySpace and Facebook. But there is concern that these sites could fizzle out in popularity, as many Web start-ups do." But I do see how pictures can bias a lender who is looking through the listings. That is if he/she isn't very careful about paying attention to more important details! O.K. let's get back to my own Prosper.com portfolio. I continue with my twice-monthly $50 automatic transfers. I have also been aggressively been adding funds in order to keep one bid going at all times. I hope that with my larger loan portfolio, I can drop back to the $50 transfers. I have now made a total of $5,964.23 in loans, received payments totaling $772.73, with an average interest rate of 14.24%. My daily interest accrual is now up to $2.12. Net income totals (interest + fees + rewards) $235.02. I havehad -0- defaults (although the 4 month late loan must surely be heading that direction!). The loan heading for default totals $(46.76). I mention "rewards" again and indeed I have received a total of $75.00 (unchanged from last month) in rewards for referrals to the Prosper.com website. Again to get a 'third-party' analysis of my Prosper.com portfolio with my lending activity and loans listed, you can visit LendingStats and view their analysis. Actually, they currently are estimating a ROI of (1.8)% on this account! I hope they are overly pessimistic. However, as you can see, I do have a number of non-performing or late loans. This does represent the challenge of investing in a peer-to-peer lending fashion! So if you are interested in exploring Prosper.com, please feel free to use the links on this page which may entitle you to a $25 head-start. Please be very careful, spread out your loans, try to avoid excessively risky loans, and be aware of the potential for loss in a process like this. I shall continue to try to provide you with updates on my own account and my success or lack thereof. This is all a new process and hopefully, by sharing with you my own successes and failures we can all learn together. And even find out if Prosper.com is a useful place for an amateur like me! I generally like to review my past stock picks on weekends taking a look at the pick price and what might have happened to an investor who purchased shares that particular week at that price. In addition, I take a look at some of the current information to see if anything new might have changed my own appraisal of a past stock pick. These evaluations assume a "buy and hold" approach to investing. In practice, I advocate as well as employ a disciplined approach to my holdings---selling decling stocks quickly and completely and selling appreciating stocks slowly and partially at appreciation price targets. This difference in strategy would certainly affect any actual performance and should be taken into consideration. During the week of November 6, 2006, I posted only a single stock pick, Bitstreat (BITS). On November 8, 2006, BITS was trading at $9.61/share. Bitstream (BITS) closed at $5.987 on July 11, 2008, for a loss of $(3.623) or (37.7)% since posting. I do not own any shares or options in this stock. Let's take another look at this stock and see if it still deserves a 'buy rating' on this blog! First of all, let's recall what this company does. "operates as a software development company in the United States. The company offers font technology products comprising Font Fusion, a font rendering subsystem that enables developers of embedded systems to render characters in various languages and formats on hardware device; Bitstream Panorama, a global text composition engine, which enables developers to draw strings of characters and lay out complex lines of text; btX3, a font subsystem that allows Linux developers to access worldwide fonts; TrueDoc, a portable font technology, which distributes text with fidelity; and TrueDoc Imaging System subsystem for developers of operating systems, servers, applications, printers, and printer controllers to provide scaleable resident fonts, as well as Bitstream Typeface Library, BTN Library, Certified Simplified Chinese GB18030 Font, Asian Stroke-Based Fonts, International Fonts, Tiresias Screenfont, Closed Caption Television Font Set and TV Font Pack, and MobileFonts." On May 14, 2008, Bitstream (BITS) reported 1st quarter 2008 results. Revenue for the quarter ended March 31, 2007, increased 16% to $6.37 million compared to $5.49 million the prior year same period. Net income dipped $57,000 or 8% to $659,000 or $.06/diluted share down from $716,000 or $.07/diluted share the prior year. How do longer-term results look? Reviewing the Morningstar.com "5-Yr Restated" financials, we can see that revenue growth remains uninterrupted from 2003 when the company had $10 million in sales and has more than doubled revenue to $24 million in 2007. Earnings have improved from a loss of $(.14)/share in 2003 to $.36/share in 2007 and $.35/share in the TTM. Free cash flow appears to also continue to show positive growth with $5 million reported for 2007 up from $1 million in 2005. Finally, the balance sheet appears solid with $15 million in cash and $3 million in other current assets. This can easily cover the $4.3 million in current liabilities (yielding a current ratio of over 4). No long-term liabilities are reported. Except for the slight dip in earnings, the Morningstar.com report appears intact. Looking at the 'point and figure' chart on Bitstream (BITS), we can see how the price of the stock broke down below the 'support line' in July, 2007 when it dipped down to $5/share which it reached in January, 2008. The stock actually appears to be on a slight rebound since May, 2008. But certainly, the chart shows continued weakness after the stock peaked at $12 in February, 2007. I am much better at determining when a stock might be a "buy" than determining whether it should now be a "hold" or a "sell". But with the stock already off 50% of its high, it seems a bit late to be advocating a sell on this stock. 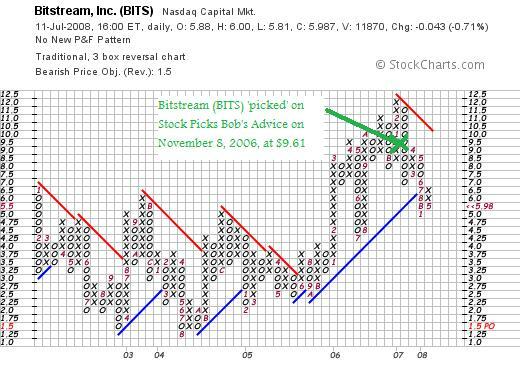 Bitstream (BITS) was the only stock I discussed that week in November in 2006. Thus, my overall performance for the week was a mediocre loss of (37.7)%. This once again underlines the importance of limiting losses on all stock purchases. I am not one to ride a stock down waiting to see the stock climb once again. Thanks so much for visiting! If you have any comments or questions, please feel free to leave them on the blog or email me at bobsadviceforstocks@lycos.com. If you get a chance, be sure and visit my Covestor Page where my actual trading account is being monitored and evaluated. If you get a chance, be sure and visit my SocialPicks page as well where my many 'picks' are evaluated and monitored. Finally, if you are into listening to mp3's on iTunes or elsewhere, be sure and visit my Podcast Page where you can listen and download some of my discussions of some of the many stocks I write about here on this blog. I wanted to share with you a picture I took a couple of weeks ago at the Mendenhall Glacier in Alaska. I haven't been doing much in my portfolio this past week. But I continue to follow my own investing system, waiting for my own portfolio to signal me as to whether it is time to be buying or replacing a stock holding. Currently, I am down to 5 positions. This is my minimum exposure to equities with my maximum of 20. I didn't get to 5 by any "thinking" or "planning" or "anticipating". I don't deserve any credit for this. Just my own portfolio indicated that it wasn't time to be replacing stocks sold on "bad news". And I listened. So I continue to monitor my portfolio, waiting for the 'all-clear' signal. This will come when the market turns higher and one of my own stocks hits a sale on the upside. When will that be? I don't know. But I know when I am given the opportunity to buy, that nickel will once again be burning a hole in my pocket. Sure would be nice. Copart (CPRT) "Weekend Trading Portfolio Analysis"
I 'wear' a lot of hats on this website. 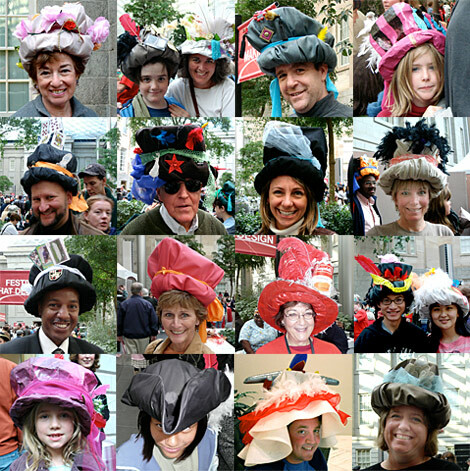 Well maybe not that many hats :). But seriously, by wearing different hats I mean I am trying to accomplish many different things simultaneously. My success with doing that certainly varies from time to time and week to week. I try to write about how to select stocks, what stocks I believe are worth selecting, how to build a portfolio, when to sell a stock and when to buy a stock, when to move from cash into equities and when to move from equities into cash. At the same time, I have been sharing with all of you readers my actual account in which I am 'practicing what I preach'. Since starting this blog, I have joined up with Covestor where you can see my actual trading account performance by visiting my Covestor Page. And I have participated with SocialPicks where you can monitor the performance of all of my stock picks. Needless to say, my picks haven't been exempted from this bear market. But one of my key roles on this blog is to keep you informed of my actual trading portfolio. I do this with reviews of the entire account as well as trying on intervals to focus on my holdings one-by-one. It is the latter that I should like to do tonight. My last review of a holding of mine was on April 12, 2008, when I reviewed my Meridian Bioscience (VIVO) stock. My Fidelity account orders my holdings by their symbol so I am now at the bottom of the alphabet with my five holdings. Going back to the top brings me to Copart (CPRT). Copart (CPRT) is what I would call an 'old favorite' of mine. That is, I first discussed Copart (CPRT) on Stock Picks Bob's Advice on May 26, 2004 when the stock was trading at $23.02/share. On September 30, 2007, shortly after actually buying some shares of Copart, I 'revisited' Copart on the blog when the stock was selling at $34.39/share. Currently, I own 180 shares of Copart which were purchased 9/27/07 at a cost basis of $33.72/share. Copart (CPRT) closed at $40.49/share on 7/3/08 for a gain of $6.77 or 20.1% since purchase. I did sell 30 shares of Copart on 5/29/08 at a price of $43.53 which represented a 1/7th of my holding at the first sale point on the upside which I have set at 30% appreciation from my cost. On the upside, my next sale would be at a 60% appreciation target which would calculate out to $53.96. On the downside, after a single sale at a 30% gain, my sale point is raised to break-even or $33.72, up from the (8)% loss limit I usually place after an initial purchase. "...provides a range of remarketing services to process and sell vehicles over the Internet through its Virtual Bidding Second Generation Internet auction-style sales technology to vehicle suppliers primarily insurance companies. Its services include online supplier access, salvage estimation services, virtual insured exchange, transportation services, vehicle inspection stations, on-demand reporting, DMV processing, flexible vehicle processing programs, buyer network, and sales process, as well as CoPartfinder, an Internet-based used vehicle parts locator that provides vehicle dismantlers with resale opportunities for their salvage purchases." On June 4, 2008, Copart (CPRT) reported 3rd quarter 2008 results. Revenue climbed 52% to $221.2 million from $145.7 million the prior year same period. Earnings increased to $46.5 million or $.52/share, up from $38.9 million or $.41/share last year. The company beat expectations on both revenue which had been expected according to analysts polled by Thomson Financial at $207.9 million, and earnings which had been expected to come in at $.48/share. If we review the Morningstar.com "5-Yr Restated" financials on Copart (CPRT), we can see that revenue growth is solid, increasing from $335 million in 2003 to $561 million in 2007 and $733 million in the trailing twelve months (TTM). Earnings have also steadily grown from $.62/share in 2003 to $1.46/share in 2007 and $1.68/share in the TTM. No dividend is paid. And the outstanding shares are rock solid at 93 million reported in 2003 and 93 million in the TTM. Free cash flow is positive and appears to be growing with $70 million reported in 2005 and $91 million in the TTM. The balance sheet is solid with $96 million in cash and $175 million in other current assets. This total of $271 million in total current assets, when compared agains the $128.9 million in current liabilities yields a current ratio of 2.1. The company is almost without any long-term liabilities with $16.7 million reported on Morningstar.com. 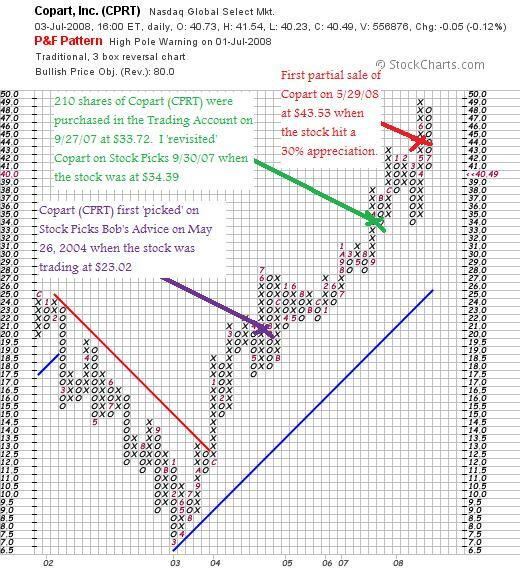 If we examine a 'point & figure' chart on Copart (CPRT) from StockCharts.com, we can see that the stock, after dipping to a low of $7.00 in March, 2003, has steadily climbed for the past five years to a high of $49 in June, 2008, only to pull back currently to its $40.49 level in July, 2008. The upward move of this stock has barely budged in the midst of the terrible market action we have been observing. The chart looks just fine to me! I really like this stock a lot. I guess the only thing that might be nicer would be if it paid a dividend. And I wouldn't be surprised to see this company do exactly that in the future. Of course I don't have any inside information on this or any of my other 'guesses'! "Drive your car until it’s old. This works really well when you buy a car that will run for 200,000 miles." It was my 'hunch' that this company would be recession-resistant. People deferring new car purchases may well find themselves replacing parts on their old car. I know I am personally responsible for purchases of parts for my kids' 1994 Jeep Grand Cherokee. It is cheaper to keep it running than to replace it. Copart continues to show good technical strength, a solid record of underlying fundamentals, and is the kind of company that might just help me get through this market correction and likely recession. 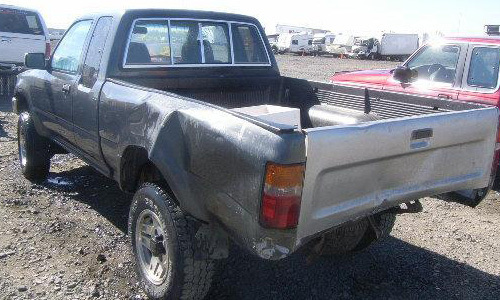 When your portfolio is banged-up, maybe a stock like Copart which specializes in 'wrecks' might just be able to find a place to make itself at home! Thanks again for stopping by and visiting! If you have any comments or questions, please feel free to email me at bobsadviceforstocks@lycos.com or leave them right on the website. Please remember to check out my Covestor Page where you can find out more about my actual trading account, my SocialPicks page where my many stock picks from the last year-and-a-half are reviewed, and my Podcast Page where you can download an mp3 or two of me discussing some of the many stocks and topics I blog about right here! One of my weekend "tasks" that I like to attend to is to review past stock selections, thereby examining the success or failure of this process. Last weekend I reviewed the stock picks from the week of October 23, 2006 (there were none) and this week going forward, I planned on reviewing the picks from the week of October 30, 2006. Unfortunately, again there were no picks that week either so I shall not be doing any reviews. But I do have some news to share with you. I am a never-ending fan of the internet and ended up over the weekend over at Gather.com. Gather.com is a community of bloggers that is divided up into different topics. I have been writing a couple of articles to kick off my participation and if you would like to read them, I wrote a small piece about the bear market entitled "Is the Stock Market Getting Un-BEARable?" and introduced the 'Gather.com' readers to my own investing strategy. Today I wrote another short piece entitled "Using Morningstar to Help Research Stocks". If you are interested in these reviews please feel free to visit and join Gather so you can participate over there. The rest of the weekend has been rather quiet. Except of course for the diminishing supply of fire crackers and back-yard fireworks still going off from time to time around here. I hope you all had a wonderful 4th of July Holiday!